Are you happy with your career situation? Being the best in your field doesn’t mean that you are guaranteed to make a lot of money, find the right place to work, or even find happiness in what you do every day. For this, you have to work on the “soft skills” as many call them, and learn to be more comfortable in areas that are not in your specialty. To me, that’s where career blogs come in to help. Below, I’ve featured the 15 best career and employment bloggers to follow in the remainder of 2015 and into the new year as well. They can help you with all types of information and skills. Have a look at what I mean. Give them a click below and check them out. 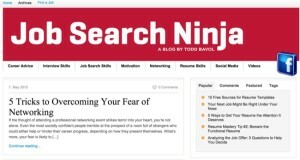 Todd Bavol made out list with the Job Search Ninja blog, well, because who doesn’t want to be a ninja? Seriously though, the site is laid out in a very easy to navigate manner, and has lots of useful tips. Stop here to sharpen up your career skill throwing stars! Let’s be honest. You have to market yourself to get the job you want. If you wouldn’t hire you, why would anyone else? Learn how to brag on yourself in a professional manner here. Do it. Now. Let Emmelie De La Cruz help you! About to graduate? Just graduated? Want to learn how to land a first job that’s worth your time? Look here to Kirk Baumann’s blog. Ah, the horror of meeting all those job recruiters in a hotel lobby. And of course we had no money to stay in the hotel so we had to drive for two hours each way. Well, no more. Visit Steven Rothberg at the CollegeRecruiter Blog and find help in locating jobs, polishing resumes, and even a free resume critique. Anna Runyan has a great site to focus on the needs of ladies. She offers coaching, courses, and lots of free training. 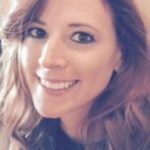 Her blog is an excellent resource for any woman in or entering the workforce. Scot Herrick would have been great for me if I had him as a resource when I first started my career. He can help you if you have little guidance in “the corporate world”. Learn to navigate the turbulent waters of corporate life at Cube Rules. Rich deMatteo has a fun blog with practical advice. 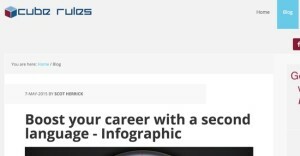 As a job recruiter, he posts his years of experience for you to learn from. Check him out. It does no good to be the best if you don’t seem like it during your interview. Karalyn Brown helps show you how to do well at your next interview and develop great communication skills. The social workplace is here. You need to learn to navigate it, both online and off. 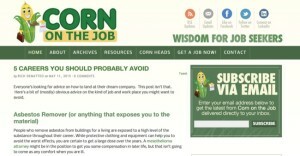 Let the folks at TalentCulture give you some insight on it. Learn how to come out of your shell here. You’ll need to be able to talk to people to get through that interview!!! You have to think the way you want to be. Deep? Maybe. But you do have to think positively to act positively. Read what Steven has to say. In your career, you will need to develop leadership skills. Yes, even if you don’t plan to be a manager, you are going to want to be a leader. Dan McCarthy’s blog can help you learn those skills. Who doesn’t want to be a freak? It’s fun, but extremely valuable. Productivity doesn’t have to be boring. If you don’t believe me, check out Annie Mueller’s site. GTD. Getting Things Done. The ultimate in time management. Even if you don’t adopt the entire system, there are concepts that you can put into practice to help. 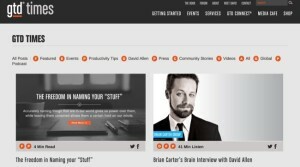 David Allen tells you all about his GTD system and even how others use it as well. Positivity. Tina Su and the team at Think Simple Now are masters of it. If you want to be happy in your career, you have to be happy. Tough times will come and your attitude will help you through them. This is where Tina can help you out. We think you’ll agree that these are the blogs to follow for career tips in 2015 and into the next year as well. Get started reading now so that you can set and achieve your goals!